1. Department of Chemistry & Biochemistry, Florida State University, Tallahassee, FL, USA. 2. Institute of Molecular Biophysics, Florida State University, Tallahassee, FL, USA. Protein profiling studies of prostate cancer have been widely used to characterize molecular differences between diseased and non-diseased tissues. When combined with pathway analysis, profiling approaches are able to identify molecular mechanisms of prostate cancer, group patients by cancer subtype, and predict prognosis. This strategy can also be implemented to study prostate cancer in very specific populations, such as African Americans who have higher rates of prostate cancer incidence and mortality than other racial groups in the United States. In this study, age-, stage-, and Gleason score-matched prostate tumor specimen from African American and Caucasian American men, along with non-malignant adjacent prostate tissue from these same patients, were compared. Protein expression changes and altered pathway associations were identified in prostate cancer generally and in African American prostate cancer specifically. In comparing tumor to non-malignant samples, 45 proteins were significantly cancer-associated and 3 proteins were significantly downregulated in tumor samples. Notably, fatty acid synthase (FASN) and epidermal fatty acid-binding protein (FABP5) were upregulated in human prostate cancer tissues, consistent with their known functions in prostate cancer progression. Aldehyde dehydrogenase family 1 member A3 (ALDH1A3) was also upregulated in tumor samples. The Metastasis Associated Protein 3 (MTA3) pathway was significantly enriched in tumor samples compared to non-malignant samples. While the current experiment was unable to detect statistically significant differences in protein expression between African American and Caucasian American samples, differences in overrepresentation and pathway enrichment were found. Structural components (Cytoskeletal Proteins and Extracellular Matrix Protein protein classes, and Biological Adhesion Gene Ontology (GO) annotation) were overrepresented in African American but not Caucasian American tumors. Additionally, 5 pathways were enriched in African American prostate tumors: the Small Cell Lung Cancer, Platelet-Amyloid Precursor Protein, Agrin, Neuroactive Ligand-Receptor Interaction, and Intrinsic pathways. The protein components of these pathways were either basement membrane proteins or coagulation proteins. Keywords: Differential protein expression profiles, pathway analysis, fatty acid metabolic process, cytoskeletal proteins, extracellular matrix, prostate cancer health disparity. Prostate cancer afflicts more American men than any other non-cutaneous cancer; only skin cancers are more frequently diagnosed . Proteomic fingerprinting or profiling is frequently used to gain insight into prostate cancer development or to identify putative biomarkers, primarily through differential expression analysis [2-9]. However, a potential deficiency of profiling studies is that they may be hampered by the heterogeneity of prostate cancer, namely the differing tumor biology within individual patients. This can lead to patient-specific variance in differential protein expression between tumor and matched controls . The low reproducibility between profiling studies of differentially expressed molecular markers is also of concern [11, 12]. While a consensus cohort of significant differentially expressed genes can be elucidated from data collected by separate laboratories and across different platforms, the overlap is still low . An alternative approach uses differential expression data to flag changes in biological pathways or groups of functionally-related proteins. Rather than focusing on expression changes of individual genes, this approach considers the cooperative nature of proteins and the co-regulation of proteins involved in the same process. Pathway approaches increase overlap between studies, provide more robust results, effectively classify disease, and highlight core mechanisms of disease that may have otherwise been obscured [14-18]. One area of prostate cancer investigation that may benefit from a pathway-based strategy is in racial health disparities. African ancestry is an established risk factor for developing prostate cancer . Epidemiologic data shows increased prevalence of prostate cancer among African American (AA) men compared to non-Hispanic Caucasian American (CA), Hispanic/Latino, Asian American or Pacific Islander, and American Indian or Alaskan Native men in the United States . A growing body of evidence presents differing pathological and clinical characteristics between tumors in AA and CA patients, including elevated prostate specific antigen levels in AA men [20-23], more high-grade and advanced stage tumors among AA men [24-26], increased tumor burden and volume [27, 28], and increased risk of recurrence in AA patients [29, 30]. Genetic studies have also highlighted differences in molecular biology between AA and CA or European American prostate cancer [31-37]. Prostate cancer health disparities are influenced by socioeconomic indicators (e.g., education, income, employment, marital status, neighborhood, etc. ); yet even after controlling for socioeconomic status, treatment and care, age, stage, and grade, reduced survival was still seen in AA men [38-40]. It is hypothesized that pathway analysis may shed light onto the nature of biological variation between AA and CA prostate tumors and its contribution to racial health disparities. In this case study, we first characterized differential protein expression and differentially expressed pathways in prostate cancer generally. This builds upon previous work that examined differential gene expression and pathways in prostate cancer . Second, because molecular markers differentially expressed between cancer and non-malignant samples may not be differentially expressed between races , we have attempted to identify differing patterns of protein expression and pathway activation in prostate cancer by race. While, proteomics-based profiling methods have been applied to examining racial differences and disparities in various cancers [42-44], to the best of our knowledge, very few studies have completed a global proteomic profile of AA prostate tumors. Fewer have taken an integrated profiling and pathway approach as presented herein. Protein expression in prostate cancer was determined using freshly frozen human prostate tumor tissues obtained from the Cooperative Human Tissue Network (Midwestern Division, Ohio State University, Columbus, OH, USA; Mid-Atlantic Division, University of Virginia, Charlottesville, VA, USA; Southern Division, University of Alabama at Birmingham, Birmingham, AL, USA; Western Division, Vanderbilt University, Nashville, TN, USA) and Meharry Medical College (Nashville, TN, USA). According to pathologist recommendations, specimen were matched by age, stage, and Gleason score, resulting in a collection of fourteen patients, nine of which also had corresponding non-malignant tissue (Table 1). During processing, all tissue was kept cold and handled in an isolated environment. Proteins were extracted into lysis buffer (0.1 M Tris (hydroxymethyl)-aminomethane, pH 7.6 (Sigma, St. Louis, MO, USA), 0.1 M dithiothreitol (Promega, Madison, WI) and 10 µL/mL of HaltTM EDTA-free protease & phosphatase inhibitor cocktail (ThermoScientific, Waltham, MA, USA)) from minced and washed tissue using mechanical homogenization and vigorous mixing. Proteins were further solubilized by heating in the presence of sodium dodecyl sulfate (Sigma, St. Louis, MO, USA). Clarified lysate was desalted and proteins were trypsin-digested in a modified filter-aided sample preparation protocol . In this method, the lysis buffer was exchanged with a series of buffers while simultaneously digesting with mass spectrometry (MS)-grade trypsin (Pierce-Thermo Scientific, Rockford, IL, USA) in a 30,000 molecular weight cutoff spin filter unit (VWR, Radnor, PA). The order of buffer exchange was a follows: 1) urea buffer (8 M urea (Fisher Scientific, Waltham, MA, USA) in 0.1 M Tris, pH 8.5); 2) iodoacetamide buffer (0.05 M iodoacetamide (Amresco, Solon, OH, USA) in urea buffer); and 3) ammonium bicarbonate buffer (0.05 M ammonium bicarbonate (Fluka/Sigma, St. Louis, MO, USA) in water). Patient clinical data for age-, stage-, and Gleason score-matched prostate tumor tissue samples. Peptides were detected through mass spectrometry using an externally calibrated high-resolution electrospray tandem Thermo LTQ Orbitrap Velos nLC-ESI-LIT-Orbitrap mass spectrometer. NanoLC-MS/MS was run in technical triplicate to enable normalization and statistical analysis. The nanoLC eluent (2-cm trap column plus 10-cm analytical column in continuous, vented configuration with a 1-hour linear mobile phase gradient from 100% solution A (99.9% H2O and 0.1% formic acid) to 45% solution B (99.9% acetonitrile and 0.1% formic acid)) was directly nanosprayed into an LTQ Orbitrap Velos mass spectrometer (ThermoScientific, Waltham, MA, USA). The mass spectrometry data were acquired using 10 data-dependent collisional-induced-dissociation MS/MS scans per full scan under direct control of the Xcalibur software (ThermoScientific, Waltham, MA, USA). The peptide threshold was 95% confidence and the stringency for proteins was 99% confidence with at least 2 peptide matches. All measurements were performed at room temperature. Protein expression data were obtained from mass spectrometry analysis as spectral counts. The data were processed to sum isoforms for 1:1 matching in pathway analyses, round any non-integer values up to the nearest count, and calculate the magnitude of expression change as the base 2 logarithm (log2) of the ratio of mean spectral counts. To ensure that a log2 ratio could be calculated for each protein, samples with zero expression counts were adjusted by adding one to both the tumor and non-malignant mean. To determine how this impacted the pathway results, the analysis was run multiple times either excluding data with mean expression of zero, transforming each entry, or transforming only those entries with no expression count. There was no real difference in the results, so only those entries with no expression count were transformed. Data processing, statistical calculations, differential expression analysis, and plotting were done in the R statistical programming environment . To determine differential expression, the mean spectral counts between tumor and non-malignant samples for each protein were compared using a two-sided, unpaired Wilcoxon rank sum test. The resulting P-values were adjusted for multiple comparisons correction using the Benjamini-Hochberg false discovery rate (FDR) method. Differentially expressed proteins (DEPs) were defined as proteins differing between two patient groups (non-malignant and tumor, or AA and CA) with at least 90% confidence after FDR correction (Q < 0.1). The Protein ANalysis THrough Evolutionary Relationships (PANTHER) Classification System and analysis tools (version 10.0, released 2015-05-15, available from http://pantherdb.org) were used to categorize PANTHER Protein Class and Gene Ontology (GO) Molecular Function and Biological Process annotations among DEPs . The PANTHER Overrepresentation Test (released 2015-04-30) was used to search the data against the PANTHER and GO databases (released 2015-05-09) to identify either protein classes or GO annotations that were overrepresented in the data by more than random chance after Bonferroni correction. Gene Set Enrichment Analysis (GSEA) was used to identify proteins (grouped as gene sets) comparatively enriched between phenotypes of interest . Curated gene sets compiled from BioCarta and Reactome databases were pulled from the GSEA's Molecular Signatures Database. Additionally a custom Kyoto Encyclopedia of Genes and Genomes (KEGG) gene set was tailored from all available human KEGG pathways by removing those least likely to be relevant in human prostate cancer (Table S1). The GSEA analysis tool (version 2.2.0) was downloaded from http://www.broadinstitute.org/gsea/index.jsp. The entire protein expression dataset was loaded into the GSEA application without filtering based on differential expression. Because mapping is done by Entrez ID, putative proteins without Entrez ID were excluded. Gene sets smaller than 5 proteins and gene sets larger than 500 proteins were also excluded from the analysis. The FDR cut-off was relaxed to 25%. Positive enrichment scores correspond to enrichment in the AA samples. Negative enrichment scores correspond to enrichment in the CA samples. Signaling pathway impact analysis (SPIA) was used to assess the importance of enriched proteins in terms of the impact and contribution to activation or inhibition of a pathway . Pathway significance is derived from the probability that the number of DEPs observed in a pathway is larger than what would be observed at random. This is the probability of overrepresentation. Pathway significance is also derived from the position of DEPs at crucial junctions that can perturb the pathway. This is the probability of perturbation. The overrepresentation and perturbation probabilities are combined into a global probability metric which is adjusted by the FDR. SPIA analysis was accomplished using the R package “SPIA”, using a differential expression cut-off based on the FDR-adjusted Q-value. Before running the SPIA program, up to date KEGG files were downloaded (accessed 7/29/2015). The same relevant KEGG pathways used in GSEA analysis were used for SPIA (Table S1). Because mapping is done by Entrez ID, proteins without Entrez ID were excluded. Comparing protein expression between all tumor samples (n=14) and all non-malignant samples (n=9) generated a protein expression profile for prostate cancer. Mass spectrometry identified 1612 proteins, with 1570 remaining after processing (Table S2). There were 48 DEPs (Q< 0.1), with 45 being cancer-associated (i.e., upregulated in tumor samples or detected only in tumor samples) and 3 being associated with the non-malignant condition (i.e., downregulated in tumor samples or detected only in non-malignant samples). More specifically, 41 proteins were significantly upregulated, 4 proteins were uniquely detected in tumor samples, 3 proteins were significantly downregulated in tumor samples, and no proteins were uniquely detected in the non-malignant samples. The distribution of log2 fold changes for all proteins was plotted in a 1-D scatter plot (Figure 1). Fold-changes for both upregulated and downregulated proteins were approximately 3-fold or greater (log2 ratio ≥ ± 1.5). A selection of these DEPs is presented in Table 2 and the full listing of DEPs can be found in the Supplementary Materials (Table S3). Magnitude of protein expression changes between matched tumor and non-malignant human prostate tissues. In this one-dimensional scatter plot, the magnitudes of protein expression changes are represented by log2 fold ratios. Red diamonds represent differentially expressed proteins at a false discovery rate of 10%. Black squares denote other proteins detected that did not reach significance. Selected differentially expressed proteins in human prostate tumors compared to non-malignant samples. Upregulated proteins with the largest fold change in expression are presented along with all downregulated and uniquely detected proteins. The Log2 fold change is the base 2 logarithm of the ratio of mean tumor expression to mean non-malignant expression. Functional classification of differentially expressed proteins in matched tumor and non-malignant human prostate tissues. (A) Classification according to PANTHER Protein Class. (B) Classification according to Molecular Function Gene Ontology terms. (C) Classification according to Biological Process Gene Ontology terms. To further characterize molecular differences arising in prostate cancer, DEPs were sorted according to PANTHER database protein class and Gene Ontology (GO) Molecular Function and Biological Process annotations (Figure 2). Only one DEP, T-complex protein 1 subunit delta, had no annotations and was thus excluded from analysis. 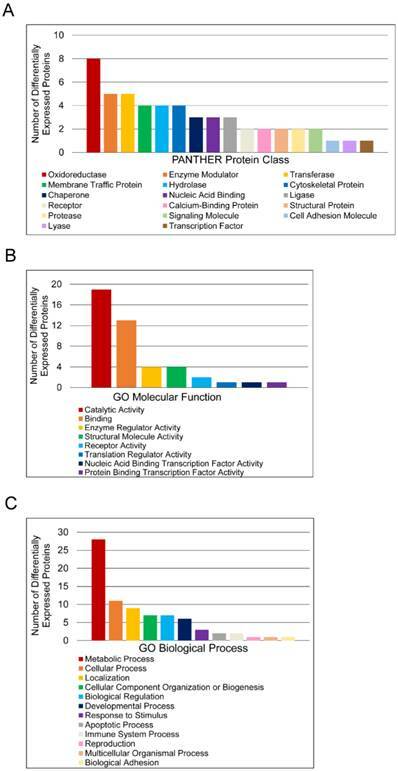 The protein classes “Oxidoreductase”, “Enzyme Modulator”, “Transferase”, “Membrane Traffic Protein”, and “Hydrolase” were the most abundant categories (Figure 2A). The label “Oxidoreductase” covered dehydrogenases, reductases, and oxidases. “Enzyme Modulator” includes G-protein modulators, phosphatase modulators, protease inhibitors, and G-proteins. “Transferase” covered glycosyltransferases, methyltransferases, acyltransferases, and acetyltransferases. “Membrane Traffic Protein” included vesicle coat proteins and membrane trafficking regulatory proteins, while “Hydrolase” included esterases, proteases, and glucosidases. “Catalytic Activity” and “Binding” were the predominant GO Molecular Function annotations (Figure 2B). The “Catalytic Activity” heading included oxidoreductase, hydrolase, transferase, enzyme regulation, ligase, and lyase activity. The “Binding” category encompassed protein binding, nucleic acid binding, calcium ion binding, and calcium-dependent phospholipid binding. Most proteins in this category were protein binding, which was more than twice as common as nucleic acid binding. The other 6 molecular function annotation groups—enzyme regulator activity, nucleic acid binding transcription factor activity, protein binding transcription factor activity, receptor activity, structural molecule activity, and translation regulator activity—had no more than 4 assignments each. The largest GO Biological Process categories were “Metabolic Process”, “Cellular Process”, “Localization”, “Cellular Component Organization or Biogenesis”, and “Biological Regulation” (Figure 2C). The “Metabolic Process” annotations included primary metabolic processes such as carbohydrate, lipid, protein, amino acid, and nucloeobase-containing compound metabolism. Mitosis and cell communication proteins were included in the “Cellular Process” group. The “Localization” category contained RNA localization and transport proteins, while the “Biological Regulation” category contained proteins involved in homeostatic processes. To estimate the significance of these categories, the PANTHER overrepresentation test was used (Table 3). For PANTHER protein classes, the analysis showed that the abundance of oxidoreductase annotations represents an overrepresentation in the data. Next, the data were queried for the enrichment of gene sets and pathways. GSEA was used to determine if any pathways were expressly associated with either the tumor samples or non-malignant samples. GSEA revealed enrichment of the MTA3 (metastasis associated 1 family member 3) pathway in prostate tumor samples (Q = 0.162). Of the 19 proteins comprising this gene set, 7 members were expressed in the dataset with cathepsin D and cadherin 1/E-cadherin contributing to its enrichment. SPIA found no pathways to be significantly activated or inhibited in tumor samples after FDR-correction. The second aim of this study was to use the integrated profiling and pathway approach to look at racial differences in prostate cancer. No significant differences in protein expression between AA and CA tumors presented at a 10% FDR, but relaxing the threshold to 13% resulted in 22 proteins having significance (Table 4). There were also no significant differences between the non-malignant samples by race (Table S4). Overrepresentation of PANTHER protein classes and Gene Ontology annotations among differentially expressed proteins in human prostate tumors. Overrepresentation was determined by calculating the probability that the number of differentially expressed proteins belonging to a particular category is larger or smaller than what would be expected based on a reference human genome of 20,814 genes. Q-values have been adjusted using a Bonferroni correction. Differences in protein expression between African American and Caucasian American human prostate tumor tissues. The significance threshold was set at 10% FDR, but proteins with Q < 0.13 are shown. The Log2 fold change is the base 2 logarithm of the ratio of mean tumor expression to mean non-malignant expression. Because no proteins were significantly differentially expressed after FDR correction when AA and CA tumor samples were compared, overrepresentation analysis was used to highlight any qualitative differences between these groups (Figure 3). Without regard for statistical differential expression, proteins with positive log2 fold changes in the tumor/non-malignant comparison were considered upregulated, while those with negative log2 fold changes were considered downregulated. Then, proteins in AA or CA samples were sorted separately. Altered expression of cytoskeletal proteins and nucleic acid binding proteins in AA tumors compared to CA tumors was suggested by the larger percentage of upregulated proteins in these classes in AA tumors coupled with greater downregulation of proteins in these classes in CA tumors (Figure 3A). 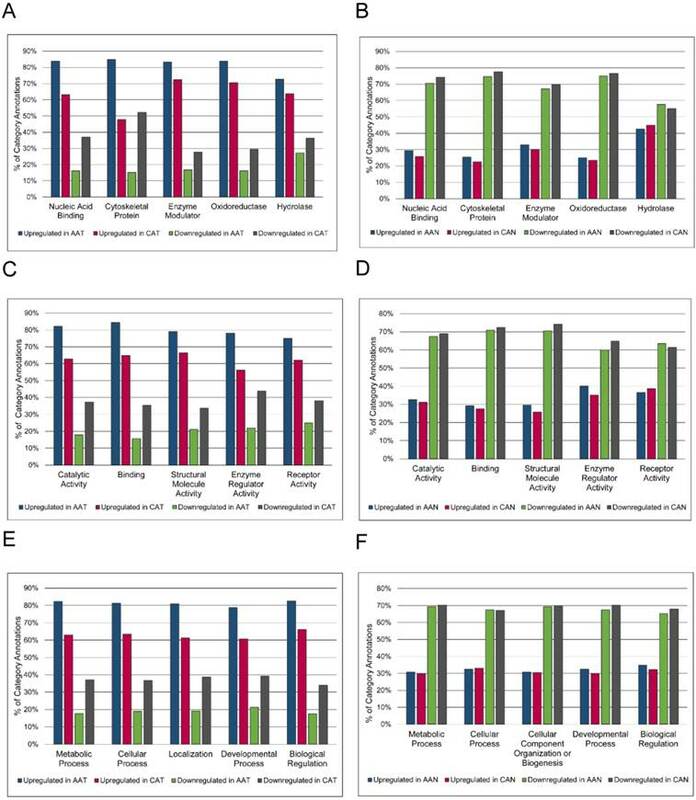 Racial comparison of functional classifications of proteins expressed in matched tumor and non-malignant prostate tissue samples. (A & B) Classification according to PANTHER Protein Class. (C & D) Classification according to Molecular Function Gene Ontology terms. (E & F) Classification according to Biological Process Gene Ontology terms. The five most abundant categories are shown. Upregulated and downregulated refers to expression in tumor samples relative to non-malignant samples. AAT = African American tumor, CAT = Caucasian American tumor, AAN = African American non-malignant, CAN = Caucasian American non-malignant. The label “Cytoskeletal Protein” included actin family cytoskeletal proteins, intermediate filament proteins, and microtubule family cytoskeletal proteins. The heading “Nucleic Acid Binding” included DNA-binding proteins, RNA-binding proteins, helicases, and nucleases. There were no striking differences in GO Molecular Function or Biological Process annotations between AA and CA tumors (Figures 3C and 3E). The percentages of upregulated and downregulated proteins in PANTHER Protein Class and GO Molecular Function and GO Biological Process were similar between AA and CA non-malignant samples (Figures 3B, 3D, and 3F). The overrepresentation of particular PANTHER protein classes and GO annotations was assessed and compared between races, pulling out those protein classes and GO annotations that were not overrepresented in both AA and CA tumors. This list was further whittled down by removing protein classes and GO annotations that were overrepresented in both AA tumor and non-malignant samples, as these differences were likely due to race regardless of disease status. The results showed enrichment of structural components (“Cytoskeletal Proteins” and “Extracellular Matrix Protein” PANTHER protein classes, and “Biological Adhesion” GO Biological Process) and catalytic activity (“Hydro-lyase activity”, “Peroxidase activity”, and “Peptidase Inhibitor Activity”) in AA compared to CA tumors (Table 5). The complete overrepresentation results can be found in the Supplementary Materials (Table S5). GSEA analysis was run comparing AA and CA tumor samples, with 5 gene sets showing enrichment in AA tumor samples (Table 6). The Agrin in Postsynaptic Differentiation pathway gene set is composed of 36 members, 12 of which were expressed in the dataset studied. Laminin alpha 4, dystroglycan 1, integrin beta 1, dystrophin, laminin alpha 2, cell division cycle 42, integrin alpha 1, p21 protein (Cdc42/Rac)-activated kinase 4, and utrophin contributed to the enrichment in AA tumor samples. Of the 14 members comprising the Platelet Amyloid Precursor Protein pathway, 8 were identified in the dataset and collagen type IV alpha 2, coagulation factor II/thrombin, plasminogen, and coagulation factor IX contributed to pathway enrichment. Enrichment of the Intrinsic pathway was due to the expression of collagen type IV alpha 2, thrombin, coagulation factor IX, coagulation factor X, fibrinogen beta chain, serpin peptidase inhibitor, clade G (C1 inhibitor) member 1, and fibrinogen gamma chain. A total of 12 proteins belonging to this pathway of 23 were expressed in the dataset. Both the Small Cell Lung Cancer pathway and the Neuroactive Ligand-Receptor Interaction pathways were enriched in AA tumors compared to CA tumors. 14 of 86 proteins in the Small Cell Lung Cancer gene set were expressed in the dataset, with laminin subunit beta 2, laminin subunit alpha 4, fibronectin 1, collagen type IV alpha 2, laminin subunit alpha 5, laminin subunit beta 1, laminin subunit gamma 1, and integrin beta 1 contributing to the enrichment in AA tumors. 5 of 275 of the proteins in the Neuroactive Ligand-Receptor Interaction pathway gene set were detected in the dataset with only thrombin and plasminogen contributing to its association in AA tumors. Differences in overrepresented proteins between African-American and Caucasian American tumors. Q-values have been adjusted using a Bonferroni correction. *Overrepresented in AA but not CA tumors. † Overrepresented in CA but not AA tumors. Gene sets enriched in African-American tumor samples compared to Caucasian-American tumor samples. Size = total number of genes in pathway, ES = enrichment score, NES = normalized enrichment score, P-value = probability of significance after permutation, Q-value = false discovery rate-adjusted P-value. In prostate cancer, pathway analysis based on gene expression data has been important for understanding molecular mechanisms of the disease [17, 41, 50-52]. By combining profiling and pathway approaches, the current study moves beyond detecting differences in the expression of individual proteins to detecting pathways associated with cancer. Through proteomic analysis, 48 DEPs between malignant and non-malignant prostate tissue were identified: 45 of them associated with cancer and 3 associated with non-malignant samples. Of particular interest were the upregulation and enrichment of fatty acid metabolism proteins fatty acid synthase and epidermal fatty acid binding protein, both of which have oncogenic potential. Overexpression of fatty acid synthase in prostate cancer has been well documented [53-56] and was confirmed in this report. Fatty acid synthase catalyzes the reaction producing palmitate from acetyl-CoA and malonyl Co-A . Fatty acids are important for building membranes and regulating genes through post-translational modification, and the synthesis of fatty acids generates second messengers used in signaling pathways . Inhibition of fatty acid synthase suppressed the growth of multiple prostate cancer cell lines, including castration-resistant prostate cancer cells, via both androgen receptor-dependent and independent mechanisms . The oncogenic potential of fatty acid synthase has also been demonstrated. Injection of prostate epithelial cells expressing both fatty acid synthase and androgen receptor into immunodeficient mice resulted in tumor growth, partially through suppression of apoptosis . Theories to explain the role of fatty acid synthase in tumor survival include 1) the synthesis of fatty acid chains generates oxidative power in an anaerobic environment to balance redox conditions; 2) the activation of some oncogenes occurs by palmitoylation; 3) fatty acid synthase alters membrane phospholipid composition and thus affects signaling; and 4) fatty acid synthase may help preserve function of the endoplasmic reticulum (reviewed in [57, 60]). Epidermal fatty acid binding protein gene transcripts and protein expression were upregulated in prostate cancer [61-63]. The roles of fatty acid binding proteins include uptake and transport of long-chain fatty acids, gene regulation, differentiation, and cell growth . Epidermal fatty acid binding protein affects cell proliferation by delivering ligands to the nuclear peroxisome proliferator activated receptor β/δ (PPARβ/δ), which regulates cell survival and proliferation genes [65, 66]. The association of epidermal fatty acid binding protein and PPARγ also has prognostic significance, namely reduced patient survival . Downregulation of epidermal fatty acid binding protein inhibited the growth of prostate cancer cells , and tumorigenicity [62, 63]. Furthermore, epidermal fatty acid binding protein expression was associated with metastasis and may also be a contributing factor to its development [69, 70]. Other interesting observations were the downregulation of cytokeratins 7 and 17 and the upregulation of aldehyde dehydrogenase family 1 member A3 (ALDH1A3) in human prostate cancer tissues compared to the non-malignant samples. Expression of cytokeratin 7 is not frequent in prostate adenocarcinomas; several immunohistochemical analyses showed positive staining in 0% to 25% of prostate cancer cases [71-75]. Furthermore, the percentage of cytokeratin 7-positive cases increased with increasing Gleason score , but a separate review found no significant differences between the number of cytokeratin 7-positive primary and metastatic tumors . Considering the patients in this study all had Gleason score ≤ 7, the downregulation of cytokeratin 7 in tumor samples is consistent with previous observations. While cytokeratin 7 immunoreactivity is typically negative in tumor samples, luminal cells of non-malignant tissue, rather than basal cells, stained positive for cytokeratin 7 . Similarly, cytokeratin 17 immunoreactivity is also negative in prostate cancer [76, 79]. As an epithelial marker, the loss of cytokeratin expression is suggestive of epithelial-mesenchymal transition in other cancers [80-82]. ALDH1A3 is important in the production of retinoic acid and the metabolism of acetaldehyde produced from oxidation of ethanol, of amino acids, and lipid peroxidation products, the detoxification of exogenous molecules, and the regulation of apoptosis . Similar to this study, ALDH1A3 expression was increased in prostate cancer tumors . ALDH1A3 is androgen regulated in LNCaP cell lines . ALDH1A3 may be a cancer stem cell marker in breast cancer, lung cancer, and melanoma, as cells expressing aldehyde dehydrogenase family 1 member A3 also displayed other cancer stem cell characteristics or were more tumorigenic [86-88]. The results of this study also suggest that the proteins of the MTA3 pathway may be of significance in prostate cancer. The MTA3 pathway, which is based on experimental evidence in breast cancer, describes the silencing of estrogen receptor-regulated genes through MTA1/3 activity. Cadherin-1 and cathepsin D contributed to the enrichment of this pathway in tumor samples, although neither was differentially expressed (Table S2). Cadherins such as cadherin-1 are involved in stabilizing cell adhesion, epithelial-to-mesenchymal transition, and signaling . The loss of cadherin-1 mRNA and protein in prostate cancer and bone metastases has been demonstrated [90-92]. Cathepsin D is a lysosomal proteinase whose expression and activity were greater in prostate cancer compared to normal samples [93-95]. Cathepsin D overexpression in cancer associated fibroblasts promoted the motility and invasive growth of prostate epithelial cells . Both cadherin-1 and cathepsin D are regulated by estrogen/estrogen receptor [97, 98] indicating a possible role of these two proteins in androgen-independent prostate cancer that may still respond to estrogens. It must be clarified that none of the regulatory elements of the MTA3 pathway (e.g., MTA1, MTA3 or Snail) were detected in the dataset, only targets of the estrogen receptor. This raises the possibility that another pathway with overlapping components may be active and responsible for the expression of cadherin-1 and cathepsin D. Further, there is very little literature establishing the mechanism of MTA3 in prostate cancer, although MTA1 is well-studied . The relevance of this MTA3 pathway in prostate cancer requires additional study. Because of racial disparities in prostate cancer incidence and mortality, interracial comparisons of the specimen were also performed. There were no statistically significant differences in protein expression of tumor samples or non-malignant samples of AA and CA patients at the 10% FDR threshold. Relaxing the stringency to 13% FDR, however, resulted in 22 proteins being differentially expressed. In this particular study, it is likely that the small sample size was not sufficiently powered to detect differences. However, this case study provides an opportunity to evaluate whether the pathway approach may be informative even in a small sample size. Despite not identifying racial differences in protein expression among AA and CA prostate cancer samples, five pathways were identified as significantly enriched in AA tumors. These pathways were the Small Cell Lung Cancer, Platelet-Amyloid Precursor Protein, Agrin, Neuroactive Ligand-Receptor Interaction, and Intrinsic pathways. The Platelet-Amyloid Precursor Protein, Intrinsic, and Neuroactive-Ligand receptor pathways were linked by clotting proteins (coagulation factor IX, coagulation factor X, fibrinogen beta chain, fibrinogen gamma chain) and proteases/protease inhibitors (thrombin, plasminogen, serpin peptidase inhibitor, clade G (C1 inhibitor) member 1). The Small Cell Lung Cancer and Agrin pathways were heavily populated by type IV collagens (alpha 1, alpha 2, alpha 6), laminins (alpha 4, alpha 2, beta 2, alpha 5, gamma 2, alpha 1, beta 1), and integrins (beta 1, alpha 1, alpha 2). Collagens and laminins are important components of the basement membrane, while integrins bind to basement membrane components with substrate-specific preference and link the extracellular matrix and actin cytoskeleton [100-102]. Together these molecules regulate cell adhesion, anchorage-independent growth, proliferation, migration, differentiation, signaling survival, and chemoresistance [103-105]. Type IV collagen, laminin alpha 1, laminin beta 1, and laminin beta 2, and integrin beta 1 proteins can be found in the basement membrane of prostate tumors [106, 107], and increasing expression of collagen type IV alpha 1 and laminin beta 1 genes was detected in high-grade and metastatic prostate lesions . While collagen type IV alpha 1 and type IV alpha 2 are expressed in normal basement membrane of many tissues and maintained in prostate cancer, collagen type IV alpha 6 is lost from the basement membrane of invasive prostate carcinomas [109, 110]. Decreased expression of collagen type IV alpha 6 also correlated with metastasis and death . Altered integrin expression is well-documented in prostate cancer and includes not only downregulation, but aberrant expression patterns . Integrin alpha 2 was lost in prostate adenocarcinomas but upregulated in metastatic lesions [106, 112], whereas integrin beta 1 was associated with prostate cancer [107, 113-115]. Laminin gamma 2 expression was also lost in prostate carcinoma tissue . The increase in collagen expression, decrease in laminin expression (all but laminin alpha 2), and increase in integrin expression (all but integrin alpha 1) among tumor samples was not statistically significant (Table S2). However, finding the enrichment of pathways containing basement membrane, cytoskeletal, and extracellular matrix components reflects the qualitative overrepresentation results for AA and CA tumors. Differences in stromal expression of collagen, laminin, and integrin genes were prominent between AA and CA prostate cancer in other studies . Overall, this study confirmed the up-regulation of FASN and FABP5 in prostate cancer. This study demonstrated that pathway approaches may be useful in studying racial disparities in small patient cohorts. However, these results must be viewed cautiously as there were no true statistical differences in individual proteins between racial groups. AA: African American; ALDH1A3: aldehyde dehydrogenase family 1 member A3; CA: Caucasian American; DEP: differentially expressed protein; FASN: fatty acid synthase; FABP5: fatty acid binding protein 5; FDR: false discovery rate; GO: Gene Ontology; GSEA: Gene Set Enrichment Analysis; KEGG: Kyoto Encyclopedia of Genomes and Genomes; MTA3: metastasis associated 1 family member 3; Log2: base 2 logarithm; PANTHER: Protein ANalysis THrough Evolutionary Relationships; SPIA: Signaling Pathway Impact Analysis; LC: liquid chromatography; LTQ: linear trap quadrupole; MS: mass spectrometry. The authors would like to thank Dr. Kenneth Iczkowski for his assistance in pairing patient samples, Dr. Zhenbang Chen for providing tissue samples, Dr. Kate Calvin and Dr. Rakesh Singh of the Translational Science Laboratory at the Florida State University Medical School for mass spectrometry assistance, and Charles J. Robbins for technical assistance. This work was in part supported by the Leslie N. Wilson-Delores Auzenne Graduate Assistantship for Minorities awarded to JSM by the Florida State University Graduate School, the Research Experience Program of Women in Math, Science, and Engineering of Florida State University to AKVL, and grants from the Florida State University and an Endowed Chair Professorship in Cancer Research from anonymous donors to QXAS. The funders had no role in study design, data collection and analysis, decision to publish, or preparation of the manuscript. 46. R Core Team. R: A language and environment for statistical computing. 2014; Version 3.1.2. Corresponding author: Qing-Xiang Amy Sang, Department of Chemistry & Biochemistry, Florida State University, Tallahassee, FL, USA. Tel. : 850-644-8683; Email: qxsangfsu.edu © Ivyspring International Publisher. Reproduction is permitted for personal, noncommercial use, provided that the article is in whole, unmodified, and properly cited. See http://ivyspring.com/terms for terms and conditions.